Can Salt Therapy help Respiratory Issues? Respiratory Issues are a growing health concern, affecting hundreds of millions of people around the world. Respiratory Issues encompass many types of diverse conditions, which vary in severity, symptoms and length. Treatment options range greatly depending on the respiratory illness, with most being over the counter medications. While medications can help reduce symptoms, many do not treat the cause of the respiratory issues. This is why many people look for alternative treatments to improve their overall health and reduce their respiratory issues. 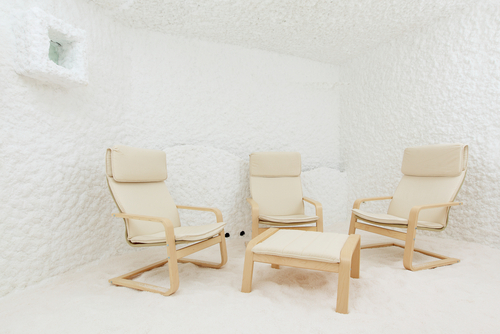 Salt Therapy is becoming more popular as a treatment for respiratory issues. How does Salt Therapy help Respiratory Issues? Salt Therapy can either use a device that releases salt into the air or it can be a room with salt walls. Both types of salt therapy have their benefits and have similar results. Salt rooms have thin sheets of salt on the walls that mimic salt cave walls, which releases the salt microscopic particles into the air. There are machines that release microscopic salt particles in the air. Many machines draw air into the device into an air filter to remove airborne pollutants before adding the salt and blowing the air into the room. These machines can be used at a clinic or you can buy your own at home machine. These salt therapy machines are very convenient and cost-effective option. You also have more control over the salt that is used for the treatment. No matter which method is being used, the air infused with salt is breathed in because you are in the room. Once you have breathed in the salt air, the air enters your nasal cavities and lungs. The salt helps increase mucus clearances in both the nasal cavity and lungs. The reduced mucus increases the amount of oxygen that the body can take in, while it also helps reduce debris and pathogens in the body. If you are using an at-home machine, the amount of salt that is released into the air is lower than if you were to go to a clinic. This can be beneficial for some people because the lower dosage does not bother their airways. Many at-home machines recommend that the machines are used for 6 to 8 hours a day, or while you are sleep. Each at-home machine is different, so you should always check the manual before using the machine you have. The other way that salt therapy can treat respiratory issues is because the salt is anti-fungal, anti-viral and anti-bacterial. Salt can kill many pathogens, which can speed up recovery from infections and it also reduces the associated inflammatory symptoms a person may have. While a high salt intake is said to have a negative effect on the body, this only occurs when the salt is being consumed. Salt therapy uses salt particles that are inhaled and enter the respiratory system, not the digestive tract. In the body, the salt that is inhaled is removed with the mucus. There is no risk to your health when you are inhaling the salt. What Type of Salt Should You Use in Salt Therapy? There are many types of salt available, but most people only know about regular table salt and sea salt. Table salt and sea salt are highly processed and contain many additives, so they are not the best options for salt therapy. Sea salt also can contain high levels of pollutants depending on where it was harvested. Rock Salt, also called Halite, is what is most commonly used in salt therapy. It typically forms colorless isometric crystals, but it can also be gray, orange, pink, purple, or blue depending on the type and amount of mineral impurities. Rock salt is the best option since it is the most natural type of salt available on the market. The minerals in the rock salt can increase the health benefits of salt therapy. Himalayan rock salt is a pinkish color because it has high levels of iron oxide. It is good for cooking and looks nice as a salt lamp, but it definitely should not be used in salt therapy due to the amount of iron oxide it has. Which Respiratory Issues can Salt Therapy Treat? Respiratory issues are widespread in today’s society and there are dozens of illnesses and breathing problems that can fall under this specific health concern. Many people with respiratory issues have more than one illness or cause of their symptoms. This is why it can be very difficult to treat all the symptoms of various respiratory issues. Luckily, salt therapy can treat the symptoms and causes of many common respiratory issues, like asthma and common allergies. Let’s take a closer look at how salt therapy treats these two common respiratory issues. Asthma is a condition where a person’s airways become swollen or inflamed, and extra mucus is produced that blocks the person’s airway. These symptoms make it hard to breathe, perform physical activity, and it can even be life-threatening if someone has a severe asthma attack. Salt therapy helps reduce the mucus in a person’s airways, making it easier for them to breathe. The salt also helps reduce the inflammation in the lungs. For many people, reducing their asthma symptoms is often the only treatment for their condition. Common allergies often cause other respiratory issues, such as coughing, sneezing, wheezing and excess mucus production. Allergy symptoms can take away from your quality of life, and can drastically diminish the amount of air in your lungs and body. Like with asthma treatment, salt therapy helps remove the mucus and opens the airways. The removal of mucus is important because it can trap allergens in the body and even make the allergy symptoms worse. Other respiratory issues that salt therapy has been found to help include snoring, sinus infection, pneumonia, emphysema, bronchitis, and COPD. It has also been found that some skin conditions like psoriasis can also be treated with salt therapy. Along with reducing mucus, improving breathing, and increasing oxygen in the blood, there are other benefits that salt therapy is a good option for you and your family. Salt Therapy helps open and clear airways in the lungs and the alveoli, where oxygen intake happens. This increases the oxygen in the blood, which increases organ function. Increased blood oxygenation has been linked to better overall health. The salt used in this particular therapy contains potassium. When the salt is inhaled, the potassium enters the bloodstream, where it stabilizes the blood pressure. Should You Try Salt Therapy? Salt therapy is a natural treatment option for many respiratory issues, including asthma and common allergies. This treatment focuses on treating the symptoms of the respiratory issues to improve breathing and increase oxygen in the blood. Some people have found that salt therapy was the best treatment for them, whereas other people did not see any improvement at all. Like other treatment options, there is no way of knowing if there is going to be an improvement with salt therapy until it is tried. With all the benefits of salt therapy, it is worth trying it, especially if you have respiratory issues that are affecting your quality of life.